According to Pelz, he instructed Phil Mickelson to focus on practicing simple chips and pitches. Because of Dave’s influence, Phil’s conversion rate improved from the 60’s to 80 percent, among the highest on Tour. “Pelz has evolved from a one-man operation, conducting esoteric studies from the far edge of the fairways, into an institution—an author and inventor, a global speaker and instructor, with short-game schools in this country and abroad. Now 72, he has penned six books, holds 17 golf-related patents and has fathered inventions of immense impact, among them the 60- and 64- degree wedge and the two-ball putter, one of the all-time best-selling clubs of any kind.” Via Golf.com http://www.golf.com/tour-and-news/golf-short-game-guru-dave-pelz-still-changing-game-golf. The 14th and 17th replica greens at Stadium Course at TPC Sawgrass. The replicas are not perfect but what is. The par three, 12th hole at Augusta National has Rae’s creek in front and an alabaster bunker. The tiered-green 14th at Pebble Beach is a challenging green. Dave designed the 14th and 17th replica greens at TPC Sawgrass, one a road hole from St. Andrews and another surrounded by water. 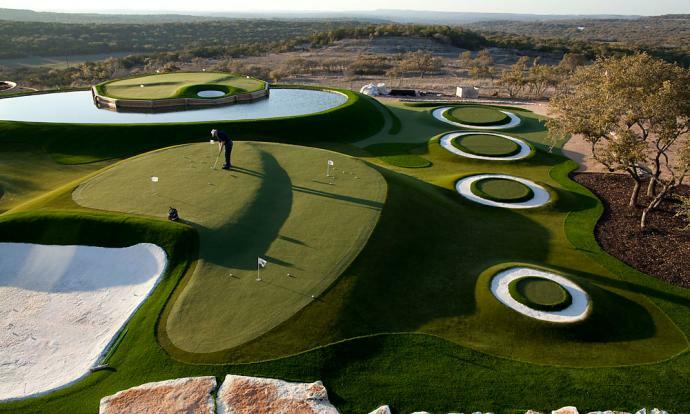 The World’s Greatest Backyard blueprint for a custom-made golf facility by Dave Pelz. SYNLawn Artificial Turf – http://www.synlawn.com/artificial-grass-products/golf-putting-green-products/. The new sports technology used to manufacture the greens were co-developed by Pelz and SYNLawn. SYNLawn worked in partnership with Dave, the founder Pelz Golf Institute in Austin, to create new turf. As a result of this sports business partnership, Dave and SYNLawn engineered synthetic grass products that not only look and feel real, but also perform like natural golf surfaces. Their synthetic turf needs no water, cutting and features a patent-pending underlayment that plays like real bent- and Bermuda grass greens. I respect the vision, tenacity and love Dave displayed for golf by making a leap of faith from working securely at NASA to living his golf sports business dreams. It lead to this golf partnership between Dave and SYNLawn. When he started out following the tour, the term “short game,” did not really exist yet in golf. Dave understood before most in the golf industry that data can be used to breakdown any shot taken on a PGA certified course, in order to improve scores. His theories centered on the notion that any amateur or Pro golfer could improve their game, especially the all-important short game, by adhering to his methods. Dave’s love of the game caused him to follow the PGA Tour for three years. Pelz needed funds to continue with his golf research so he invented and designed equipment. In 1986, he visualized the two-ball putter. Dave sold the rights after more than ten years to Callaway Golf for $250,000. Callaway has since sold over 5 million of these putters to date. While following the tour, Pelz developed his data centric golf philosophies which emphasized that a shot taken inside of 100 yards are, “60 to 65 percent of golf.” He shared hard-earned data that showed how players missed shots at a high rate of 16% – 20% when taken within 100 yards. Finally, he determined that most players’ ‘distant control’ part of their game was not optimized. Dave’s insistence that players carry more clubs in order to improve short shots inside of 100 yards, rather than the one club that was used during the 1970’s, is not rocket science but close to it. His scientific theories revolutionized golf and were also a sportsbiz boom for club manufactures. Golfers needed to carry more specialized short-game clubs which meant more sales for golf companies. Course management also developed new standards thanks to a sport wide emphasis on the short game. Sports Techie, The 2013 golf season is upon us once again and I thought you would enjoy learning about a Sports Techie master of his trade. What Phil has done for golf tech over the years is groundbreaking. To create and install a custom short game facility that mimics the best greens in the world is an amazing feat. Pelz is an automatic Sports Techie golf hall of fame member. I hope to meet Phil someday soon and talk about his life journey pioneering and golf technology advancements. Follow @PelzGolf on Twitter for everything pelz, pelzgolf, short game, putting, and research, instruction. You can find his books on Amazon. When your crib is the world’s greatest backyard like Phil’s, you are an Ultra Sports Techie.